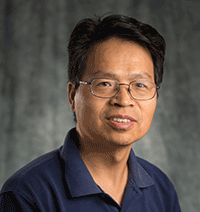 Scientist Zhuanfang (Fred) Zhang was selected as an "Outstanding Associate Editor" for 2016 by the Soil Science Society of America Journal (SSSAJ). Zhang was recognized for his professional contributions in the oversight of manuscript reviews. An article will appear in Crop Science Society of America News acknowledging Zhang and other outstanding editors and reviewers. "Associate Editors are the foundation of the SSSAJ Editorial Board, playing a critical role in overseeing manuscript reviews," wrote SSSAJ editor Sabine Goldberg. "Because of the extra effort by associate editors like you, SSSAJ is one of the premier soil science journals in the world." Zhang joined PNNL in 2001. He is a member of the Soil Science society of America, the American Geophysical Union, the International Union of Soil Sciences, and the Soil Physics Multi-State Research Project. Zhang earned his Ph.D. in Soil Physics from the University of Guelph.